March came in like a lion, windy and cold. If you're planning a visit during the early spring, check out the Who's Open page so you'll know where you can eat, sleep, shop, and play. Spring opening dates for your favorite places are on there, too! Even with limited options for ways to spend your money, Ocracoke is a great getaway. The best part of a winter visit is the great outdoors. The winter beach is amazing. Springer's Point and the NPS Nature trail never disappoint. Less is more around these parts. 6pm: Hyde County Board of Commissioners meeting @ Community Center. The agenda and packets for the Monday, March 5, 2017, Hyde County Board of Commissioners meeting are now available to the public. Click here to view the documents. The meeting will take place via teleconferencing equipment in the Hyde County Government Center and in the Ocracoke Community Center. The public is invited to attend. 4:30am: IF they are running, the Hatteras-Ocracoke ferries will switch to their spring schedule. More info here. 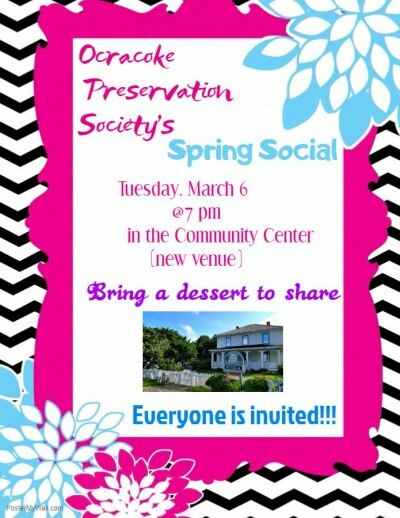 7pm: OPS Spring Social @ Community Center. All are welcome (not just OPS members) – please bring a dessert to share. 6pm: Family Movie Night @ Ocracoke Library Free event! Come out to watch Boss Baby in 3-D! Kids under 10 must be accompanied by grown-up. Eduardo's Taco Stand opens for the season! 6pm: Women's Wine Tasting @ Zillie's It's the Annual Ladies Wine Tasting, oo-hosted by Angie Todd and Sarah Fiore! Taste some great wines and wear your favorite wig! NO men are allowed till 7:45 pm, and Zillie's will stay open until 10pm. Make a reservation here. March is a busy month -- lots of spring openings and annual meetings and more!